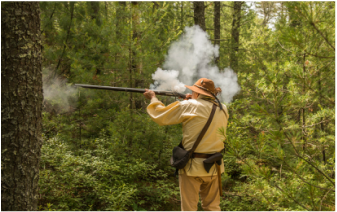 Black Powder is a more primitive type of shooting using a muzzleloader firearm. Members enjoy black powder shooting due to it's unique challenges where firearms are loaded one shot at a time by hand and ignition is delayed. There are some hunting seasons that are strictly for muzzleloader rifles only. The Rod and Gun Club of New Bedford offers a ten shot primitive shooting course through a wooded path. The targets are at various distances with 1/2" steel back stops (lead traps). Daily from 9:00am to sunset. Muzzle loading rifle with any type of sights & ammunition. If you are new to the sport: a couple of loaners are available for any one that wants to try muzzle loader shooting for the first time. All members, their families, and public (during sanctioned events). Juniors are welcome - they are our future for the shooting sports. See Hunter's Walk Rules for club regulations. Lead only on the Hunter's Walk. Black Powder loosely follows the rules established by the National Muzzleloading Rifle Association and the NRA.